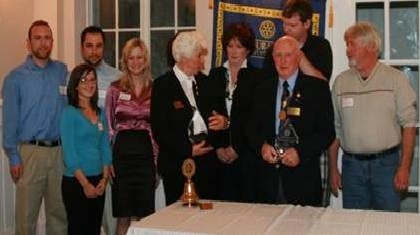 Milton Rotary Club is reaching out to busy, new Miltonians with a second meeting time, Friday mornings at 7:30 AM. In a bid to attract new members, the Rotary Club of Milton is adding a second meeting time in addition to its usual Monday meetings at 6:30 PM, creating greater flexibility for busy Miltonians who are looking to give back to their community. Already many prospective new members have expressed interest and plan to attend a meeting on Friday, December 21 at 7:30 AM. Members will be able to attend whichever meeting is convenient to them that week. Morning meetings will be efficient and will run only one hour with guest speakers and breakfast available. Prospective new members can contact Rod McLachlan at rodmclachlan (at) hotmail.com or call 416-807-6589 to RSVP for the info session. "The creation of this second morning meeting time will allow small business owners and commuters alike to get involved on their own schedule, whether it be Friday mornings or Monday evenings," said Rod McLachlan, club coordinator of public relations. "We welcome anyone who wants to network, who wants to give back and who wants to develop professionally while having fun at social events." Rotary's 1.2 million members believe changing the world starts with a commitment to Service Above Self. In more than 34,000 clubs worldwide, members are volunteering in communities at home and abroad to support education and job training, provide clean water, combat hunger, improve health and sanitation, and eradicate polio.